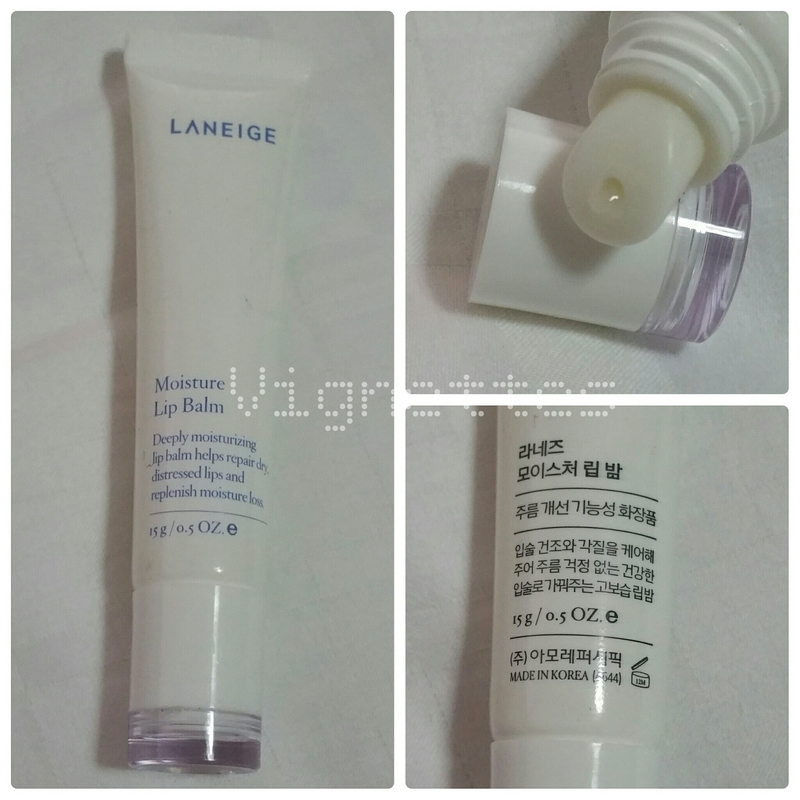 I bought the Laneige Moisture Lip Balm when I was in Seoul last year. This was part of my Myeong Dong haul in June 2014. It was not a planned purchase. Rather, it was because I was experiencing dry and chappy lips, and I bought it out of desperation to heal my lips. Water Friendly Polyols Technology & Lip Care Complex prevent dryness and heals chapped lips. The ingredient, Adenosine, has an anti-wrinkle effect and stimulates cell function. Also Texture Enhancing Technology makes lip texture soft and immediately adds energy to dry and inelastic lip. I like the texture of the gel, and how easy it is to apply on my lips. Usually, with a cleaned finger, I will dap a 2mm drop and smooth it onto my lips. It helps with moderately dry lips (ie mild peeling cases) but I didn’t find that it works as quickly or effectively for severely chapped lips. I would usually apply this before I use my favourite VDL Triple Lip Tint just to boost the moisture level. Typically, after using this item, I will find the dry skin falling off to reveal smooth and hydrated lips. This tube of 15ml can last quite a while if you are only applying the product on need basis. It is non oily and can work as a subtle gloss if you do not like your gloss to deliver high shine. This product is available in most Laneige counters. If you are in Myeong Dong, you may be able to find this product in places such as Watsons. Else the Laneige or Aritaum boutique shops are your best bets. At my favourite online shop, Koreadepart, this product retails for USD12.20 currently. I chanced upon Karen Murrell (KM) lipsticks when I was shopping on Taobao, the Chinese equivalent of Amazon and Korean Gmarket. It caught my attention because several vendors who are selling this product claimed that this is a “可以吃的口红” or “lipstick that can be eaten”. They also claimed that this lipstick is safe for pregnant women. I thought that products which are safe for mothers should be very safe, so I did a run of the product background and found the KM website. I did eventually grabbed what you see on the left from the Taobao website, if you’re wondering if I had bought it from KM website directly – coz I was buying a lot more from Taobao and I though it would be a lot cheaper to just ship them back together with my other purchases via my favourite agent, 65daigou. Based in New Zealand, the KM Lipsticks are made from natural based ingredients. They do not contain any mineral oils, animal-based material, parabens or preservatives. And because of the fusion of Mother Nature’s miracle ingredients, the more you use KM Lipstick the better condition your lips will be in. This high-quality formulation means KM Lipsticks are long lasting on lips, and they smell and taste great. For green warriors out there, you’ll be happy to know that the packaging of the KM range, with its original artwork, has been designed with sustainability at the forefront. The outer packaging is a 100% recyclable and renewable box made from New Zealand trees and printed with soya ink. (Source – KM website). The KM lipsticks are moisturizing and nourishing because of the natural ingredients used in making them. 1) Karen Murrell Official Website – And I wish to congratulate the KM team for bagging another nomination in NZ! 2) Taobao – if you are a frequent online shopper like me! 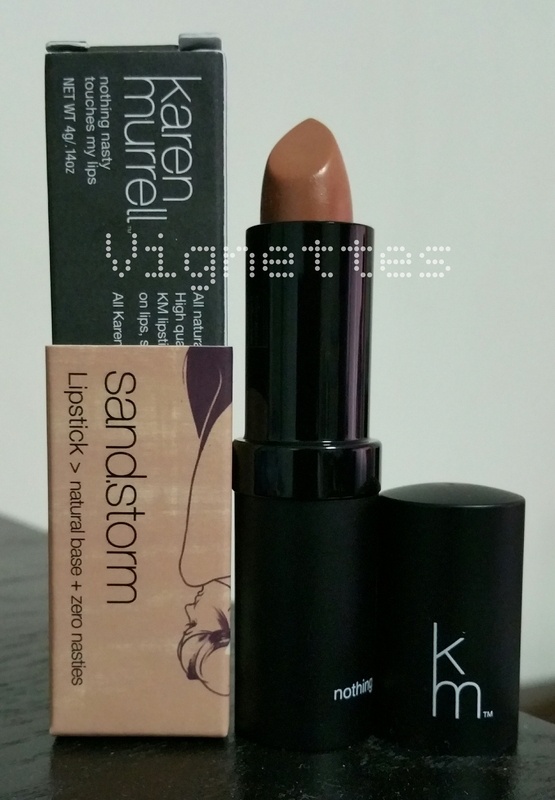 Drop me a comment on your experience if you have also used Karren Murrell Lipsticks and loved it just like me! Shiseido is one of the forerunners in the development of whitening products. They have also been pushing out sunscreen that works well with their whitening products. I bought the Multi-Defense UV Protector when I was looking for a sunscreen that does not require me to wash off with makeup remover. After a long day at work, all I wanted was to have a simple skincare regime that will not remove too much of my skin’s natural moisture (I was using oil based make up removers at that time). 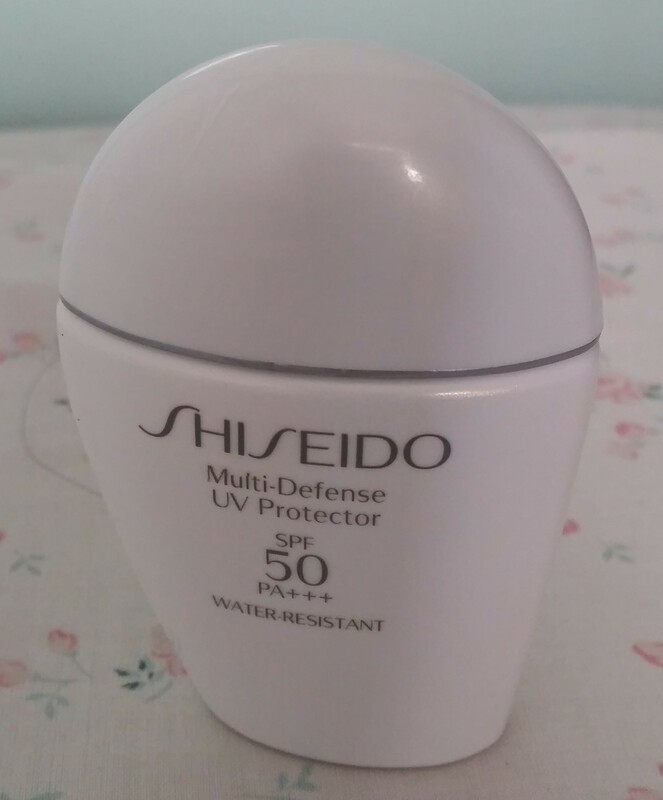 Then I received a Shiseido advertisement in my mailbox talking about this revolutionary sunscreen that can be washed off with normal facial cleanser, and immediately I jumped into it. Feather-light to the touch, this highly effective lotion-type UV protector is resistant to perspiration and sebum, providing ample protection against external aggressors such as UV rays, for the maintenance of beautiful, healthy-looking skin. ･Exclusive OptiVeil-UV technology provides advanced protection from UVA/UVB rays that may cause photo-aging. ･Scutellaria Baicalensis* helps prevent UV damage to essential fibroblasts which produce collagen and elastin, the key elements to resilient, youthful-looking skin. ･Rose Apple Leaf Extract* helps prevent DNA damage caused by harmful UV rays. ･Hydro-Restoring Complex contains moisturizing amino acids that naturally exist in skin. Provides sufficient moisture for skin that is smooth to the touch. ･Thiotaurine combined with Rose Apple Leaf Extract* counteracts oxidation, the damaging process which accelerates skin aging. ･Free of any sticky residue, doubles as the ideal base for a long-lasting, beautiful foundation finish. Is easily removed with a daily cleanser. The texture of the sunscreen is milky (if you had used sunscreens from Aqualabel or Anessa (drugstore products by Shiseido) or even Mentholatum, you will notice that the japanese sunscreen is usually milky and the texture varies based on the density of the milk). As with similar Japanese sunscreen, you are required to shake the bottle to mix the product before use. This product does not give a white powdery sheen on your skin compared to some of the other Japanese sunscreens, that tends to make your face look a shade whiter. In case you don’t already know, the Multi-Defense UV Protector also acts as a makeup base. After your daily moisturizer, apply the Multi-Defense UV Protector on your skin before your foundation. I have used this together with my mineral powder foundation, and the results has been satisfactory. It held the powder well and presents a relatively smooth complexion on my combination skin. However, I have to also point out that I am in air-conditioned environment most of my time hence the review is only if you are in cooler and less humid environment. If I were to use the Multi-Defense UV Protector on its own without foundation or make up, I will use my clarisonic and my trusty facial foam to wash my face. No outbreaks on the next day! I had bought my Shiseido products from their counters or from Duty Free Shop (its cheaper!) – including this Multi-Defense UV Protector. The small 30ml bottle is handy and fits into my handbag as I move around in the day. I could not find this product on the Shiseido’s Australian Website but I did find it on their Singapore Website. Please let me know if you can find this product in your home country so that I can share it with the readers of this blog! VDL stands for “Violet-Dream-Luminous”. It is an international cosmetic brand that was founded in 2012 by The Color Lab of LG Household & Health Care. 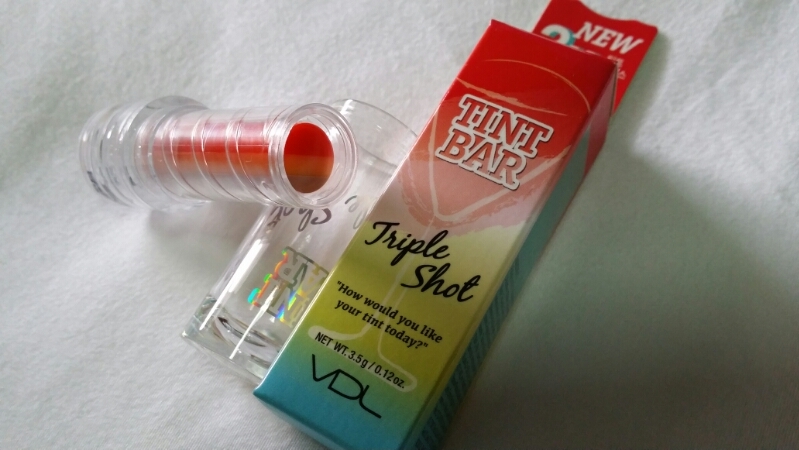 I have been using VDL Triple Shot Tint Bar for a while and I am most impressed with the colour when I wear it on my lips. I have in the picture the orange shade. Initially I thought it will look too bright on my lips but it turns out to be a subtle shade of rose pink. The tint lasts – yes it does and does not come off as much as easily when i drink – well its a tint right? I have read some earlier reviews that people find this not hydrating enough and my own experience is similar. So I usually will wear a moisture balm before putting this on esp on days I don’t drink a lot of water. You can wear this tint to create the bitten look or just glide over the lip like a normal lipstick. I love this tint but do remember to clean it off using an eye and lip remover just so that there are no left behinds. How to create the ‘Bitten’ or the ‘half-eaten lipstick’ look? Simple. Hold the lipstick with the red hue below and the pale skin colour on the top (you should see 3 horizontal layers of your lipstick). Run it over your lips holding your lipstick in this manner for the upper lip. Then rotate the colours with the red hue on top and the pale skin colour below. Run this combination over your lips in this manner. You should see the red hue nearer to the centre of your mouth, and the pale skin colour outside your mouth. This is what we call a ‘bitten’ look. Quite popular with korean stars! In Singapore, there are 4 VDL Stores – located at Suntec City, Jurong Point, Bugis Junction and Bedok. The VDL outlet in Suntec City (where I’ve checked out) is located on level 2 of Tower 5. The shop carries other VDL products as well. Of course, the best is to purchase VDL products from the VDL stores which are peppered all over MyeongDong! 1) Qoo10 – search for VDL and you should be able to find vendors carrying VDL products. 2) Taobao – there are always sellers importing VDL lipstick from Korea here. The pricing may not be as competitive as those on Qoo10 but is a good choice if its nearer to where you live. Those living in Singapore wanting to purchase from Taobao, I’ll recommend you use 65daigou to bring in the products. I have used this service several times and the purchasing team has been very reliable and efficient. I’ll blog more next time. VDL carries skin care products on top of make up palettes, foundations, lipsticks and primers. Do ask the sales staff for their star product if you are a junkie like me! I was introduced Marc Anthony Moroccan Oil when I received it as a gift from a relative. This is an amazingly fragrant oil that is neither too thick nor too thin to be applied on my hair. These days, I carry it around with me whenever I go to the gym or vacation. Stored in a slim bottle that is about 15 cm tall, the oil that in translucent yellow can be pumped onto the hand (for me 1 pump is sufficient) and applied to moist or dried hair. Personally I prefer to apply this to the hair ends when it is still moist from toweling dry. For those of you who use the hair dryer, make sure the hair is not fully dried when you apply this oil before continuing with further drying. 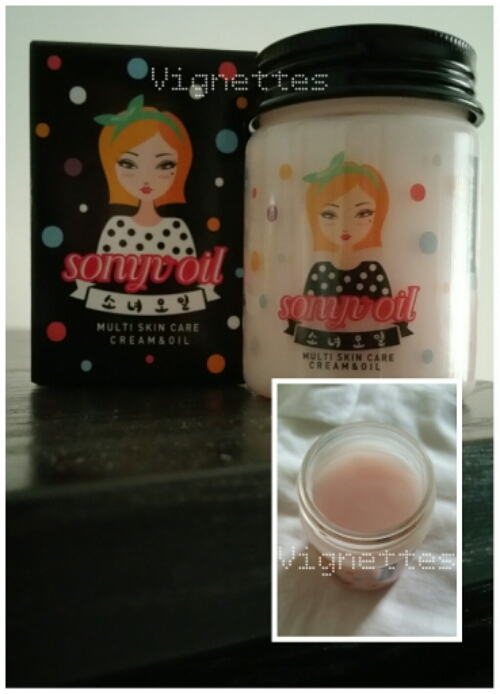 I thought the oil carries a fragrant jasmine / frangipani scent with nutty undertones. It feels calming when I apply before I go to bed. When you wake up the next morning, the hair looks well nourished and knot free. I loved this bottle so much that I bought another bottle so that I can have one bottle ready at home. Go grab a bottle from your nearby pharmacy or Watsons now!